The quality Typhoon 2 in 1 air hockey and table tennis table from Mightymast combines these two fun games providing maximum enjoyment for everyone. 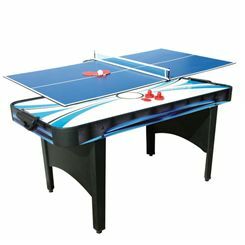 The table tennis top sits on top of the air hockey table and is easily detachable so you can change between activities quickly and simply. The set contains everything you need to get started straightaway: 4 pushers, 4 pucks, 2 table tennis bats, 2 table tennis balls and a net. There is an electric scorer and a mains operated fan motor for the air hockey table which has a high gloss surface for fast play. The table is strong and has a stylish design with colourful graphics. 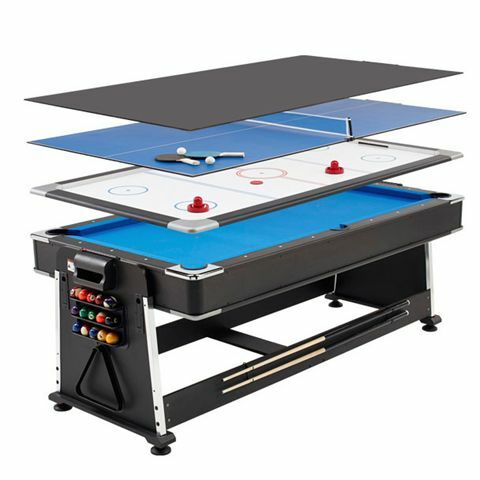 The Mightymast 7ft Revolver 3-in-1 table lets you play a great game of pool, air hockey or table tennis all on one simple to use game table, ideal for rooms where space may be limited. The 7ft professional size pool table’s cloth and cushions are good-quality for excellent play and response. 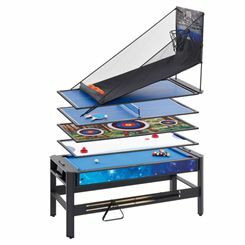 The air hockey table features a powerful fan motor for fast and smooth action, and the adjustable feet mean level playing on all games. The space-saving swivel top design can be operated by just one person to change between games in seconds. Convenient built-in storage racks hold all accessories and the protective top cover lets it serve as a regular table when not in use, making it very practical. The exterior is stylish, with metal chrome corners, and all the accessories are included to get you playing right away. 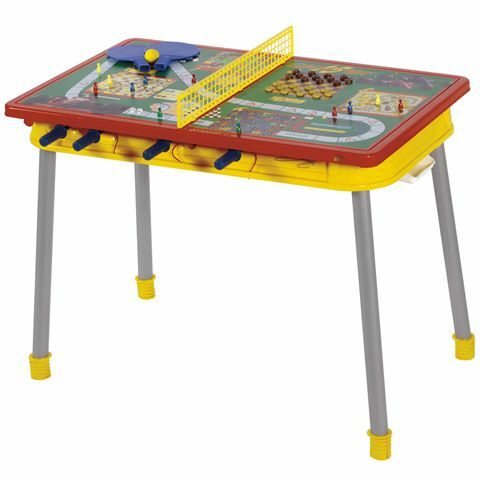 The Mightymast Dribbling Plus multi-games table provides a great range of games and ensures hours of fun for your kids. This innovative table, which also converts into a desk, includes 11 fantastic games and comes complete with all necessary accessories. It is made from a sturdy, plastic unit with strong steel legs and folds away to ensure easy storage. The Sweatband.com table games range covers multi-game tables, pool tables and snooker tables (wooden and slate), air hockey tables and football tables so whether you are looking for a present for the kids, a friend, or something for the house, you will be sure to find a the right table to suit right here. 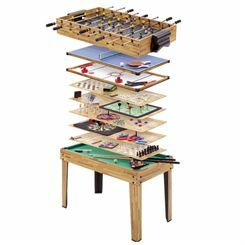 With all the top products from leading brands like BCE, Riley, Mightymast, Garlando, Buttefly, Cornilleau and more, you will find top quality games tables at rock bottom prices!